If you want your power assist system to be more powerful you have, by large, three options to consider. Reduce the bike weight and/or the rider weight. Improve the aerodynamics of the bicycle. An electric recumbent bike will improve the performance of the power assist system by improving the aerodynamics of the bicycle. The same motor wattage will preform much better because of this advantage. An electric recumbent bike combine comfort, speed so you will be able to ride it with ease for most of your commuting and rides. After all, it is not all about the motor and battery, because it's the bike which you sit on, have to handle and feel comfortable. Recumbents are divided by their wheelbase - short, medium, long. Their handlebar position - over seat or under seat. Also, there are recumbents with two wheels, recumbent trikes with 2 wheels in front and one at the rear and also two rear wheels and one at the front. To read more about the different types, log on to: www.bicycleman.com. There are even tandem recumbents. To read more about recumbents, log on to the internet authority about recumbents at: www.recumbents.com. There are two main advantages for recumbents over regular upright bicycles - comfort and speed. The rider's position on a recumbent is very laid-back. You don't have to hunch over the handlebars and your back is fully supported by the supportive and comfortable chair-type-seat rather than perching on a saddle. Therefore, there is no strain and pressure on you neck, back, shoulders, hands, knees or wrists. It is great for everyone, and especially to people who find riding a regular bicycle uncomfortable, for people with serious back issues which prevent them from riding in on a typical upright bicycles. The recumbents are more aerodynamics then traditional bicycle. The low rider position, the fact that the legs are in front of you and not below you and the surface area of the whole bike which is greatly reduced causing the bike to be less prone to wind resistance and therefore, very fast. You may think that although the aerodynamics is being improved, the energy that the cyclist can produces is less then on an upright bicycle. But it isn't the case at all, the chair-type-seat offer a firm support and allows the riders to produce a considerable amount of energy. From a safety point of view, recumbents has their own benefits. First of all, both feet can easily reach the ground. Second, sitting closer to the ground means that falls to the side hurt much less. Third, in a collision, your feet in front provide shock absorption and prevent the head-first fall over the handle bars. the first part of your body to hit an obstruction is your feet, not your head. And fourth, you can pull the brakes as hard as you need to without fearing of being thrown forward because of the large braking power. Recumbents also have longer frames then traditional bicycles. In the case of an electric recumbent bike it can be more convenience to mount additional batteries as there is more space. The additional space on the frame means that you don't have to squeeze all the electric parts, instead you have plenty of freedom for tuning and tweaking. 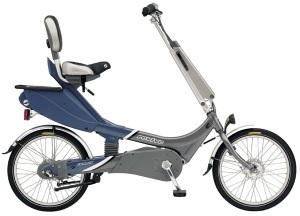 Riding a recumbent require a different set of muscles in comparison with upright bicycle. Your muscles have to adapt to the new riding style and meanwhile you will ride slower then you used to be (But not for long...). The center of gravity is different from upright bicycles. The handlebar, brakes and the pedals are positioned in a different way. Therefore, you will have to get used to riding a recumbent and develop the same feeling of security and balance that you probably have on an upright bike. 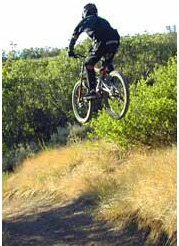 Another disadvantage is that you are less stable on rough road conditions, like in off-road riding. You can't just hop the front wheel of the recumbent like in upright bicycle, so pots, rocks, sidewalks or any other similar obstacle is not welcome. Recumbents are not so popular (And electric recumbent bike are even less popular). You have to make sure that you have a bike shop nearby who specialize with recumbents and can take care of your recumbent if necessary. Also, check that they hold spare parts for the electric recumbent bike (and for the electric components (Also, you always have the option to keep spare parts at your house). From a safety point of view, your lower position means that you are less visible. There are recumbents cyclists who use safety flags to improve there visibility. Usually, to solve this issue, a wider gear ratio is used by recumbents, but there is another solution. An electric recumbent bike is a perfect solution for solving this gap in the recumbent world. Recumbents may be a drag on hills, but an electric recumbent bike solve this issue while holding all the other advantages of riding a recumbent. If you want to read more about the recumbent bike vs. the upright bike, click here: www.biketcba.org. 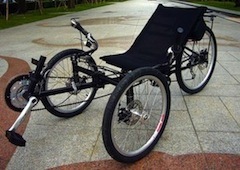 And if you have an interest in DIY electric recumbent bike projects, log on to:www.recumbents.com - DIY recumbents. Does it take a long time to get used to a recumbent? The center of gravity is different from upright bicycles. So learning to balance, especially from standing position can be hard at first and it may take time to get used to. The handlebar, brakes and the pedals are positioned in a different way. You will have to get used to it and develop a sense of security. To overcome this hedges, try to be relax and be open minded. You will master the recumbent bike in no time. I'm referring to the two wheels recumbent types since balancing on a three wheels recumbent is obviously not a problem. First of all, sit comfortably with the back and shoulders resting firmly on the chair-type-seat. Now remember when you start to pedal, never exert any force on the handlebar. The correct grip of the handlebar is kind of relax grip. Start pushing on the pedal of your strongest leg, it's important especially in a steep position. Push hard and firmly and it should give your enough balance so you will be able to incorporate the other leg. With the help of the electric assistance system, it is even more simpler cause you can start moving forward without pushing hard with your strongest leg while balancing. You will learn how to handle the recumbent in no time. After a while, it will even feel odd to you to ride a upright bicycle because of all the strain and pressure. 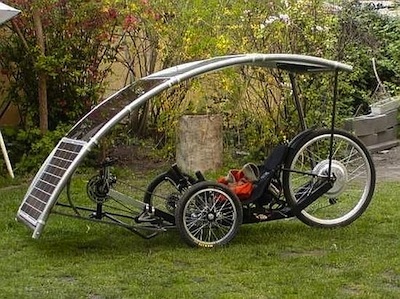 Because of the longer frame of the recumbent, it offer more space for cargo which can be used for solar panels.